Vortex Viper PST Gen II 2-25x50 EBR-2c (MOA) Riflescope PST-5255 makes its way from the list of newest products by the brand in 2017. This scope with Vortex EBR -2C MOA Reticle is an updated version of the best-selling Vortex Viper PST (Precision Shooting Tactical) series and one of the best riflescopes for shooting requirements. It proves to be extremely advantageous for shooters who wish to have a dominating or controlling position from close quarters, long range distances and in every other situation. Moreover, it is an excellent choice for dialing precision long range shots. Improved attributes take Vortex Optics' 5-25x50 Viper PST Gen II Riflescope’s performance several notches higher and also add to the shooting prowess of the user. The list is inclusive of Tactical - RZR Zero Stop, XD extra-low dispersion glass, XR anti-reflective lens coatings, ArmorTek ultra-hard lens armor, Argon gas purging, waterproof protection, 30 mm scope main tube, ample eye relief and wide field of view. 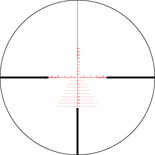 Vortex PST-5255’s hashmarked reticle, on the first focal plane, incorporates MOA based subtension lines along with floating wind hold dots for ranging, holdover, and windage corrections. I recently purchased a Savage MSR 10 long range in 6.5 Creedmoor. I soon thereafter purchased this Vortex Viper PST Gen II 5-25x50 FFP EBR-2C MOA Riflescope along with the following Vortex accessories for my scope including the Sport Cantilever 30mm Mount, the SV-5 Switchview Throw Lever, and the Lo Pro Bubblevel 30mm. I would like you views to know that while I was installing the pro bubble level on the scope the ring broke. I called Vortex and they sent out a new one the same day!! I want to think Vortex for such good and fast replacement of this Lo Pro Bubblevel. It’s not every day that a company would be so willing to honor such a warranty item the way you do. This first contact with Vortex really sets a very high bar and my confidence level of my purchase has increased 10 fold.